Demand for refractories in the US will rise 3.3 percent per year through 2019 to $3.1 billion. Volume increases will be much more sluggish, as improvements in refractory designs enable less material to be used per ton of output. Nonclay refractories will outpace clay refractories based on performance advantages that boost the use of nonclay types. 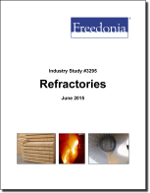 This study analyzes the $2.6 billion US refractory industry. It presents historical demand data (2004, 2009 and 2014) with forecasts (2019 and 2024) by refractory form (e.g., bricks and shapes, monolithic), material (nonclay, clay) and market (e.g., metals industries, nonmetallic mineral processing, engineering contractors, nonmanufacturing industries, petroleum and chemicals). The study also considers market environment factors, details industry structure, evaluates company market share and profiles 25 industry competitors, including HarbisonWalker International, Minerals Technologies, and Magnesita.